1. Skin eruptions since 1 month on arms, chest, abdomen, back. 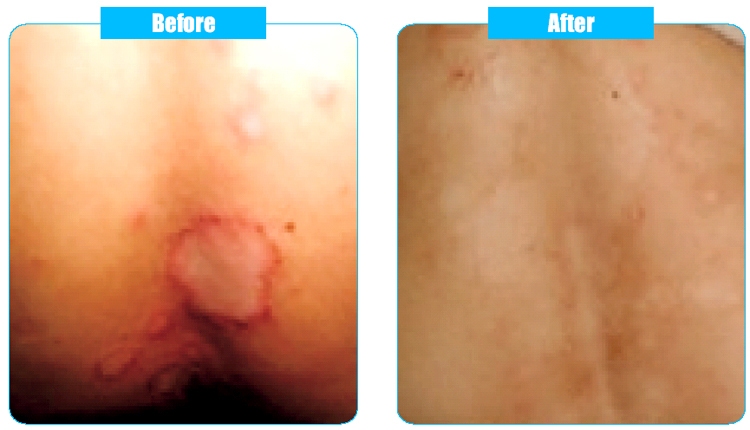 The eruptions started from neck with severe burning and itching; she used to apply some topical application on eruptions in affected parts. 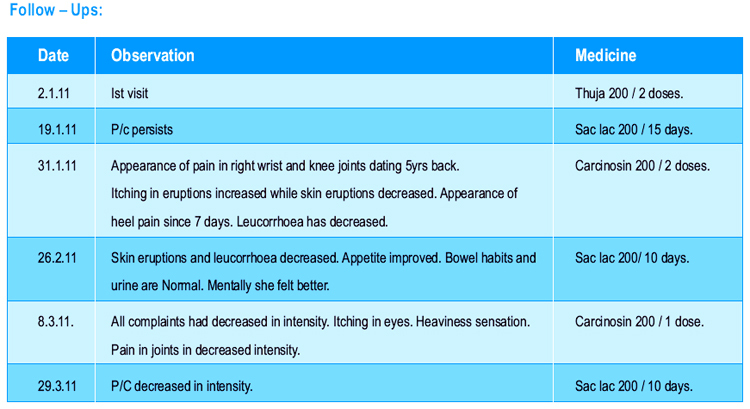 The eruptions < on contact with water and soap leading to scratching which <ed. The eruptions were mostly left sided. 2. Scanty menses since 6 months, duration 2 days; cycle 28+/-2 days, dark red, clotted. Complaints since Tubectomy 1 yr back. Copious leucorrhoea since 1 yr, transparent, whitish, staining, both before and after menses with constant backache. 3. She complaints of flatulence after meals with heaviness sensation. 4. Dandruff, white, with itching since 1 yr.
5. Hoarseness of voice since 3-4 days. Hypothyroid taking medication for the same from Institute of Nuclear Medicine and Allied Sciences, NewDelhi since 2 months. She had Typhoid (10-11yrs) back. Allergic eruptions 2- 3 times after delivery from warm food. Boil on back in 2010 treated with skin ointment. H/O of UTI (twice – 2009, 2010). 2 Brother and 2 sisters. 1 son and 1 daughter – FTNVD at Hospital. Hot patient, wears less sweater in winter. Thirst for large quantities of water at long intervals. Bowel habits and Urine are Normal. Perspiration from axilla and back, offensive and non-staining. Sleeps for 7 -8 hrs but feels unrefreshed in morning. She likes onion and spicy food and has an strong aversion to sweets. Good marital relationship but irritability and anger as her husband stay outside and come to visit her once in a year. Due to anger she frequently beats her children from slightest cause. Slightest contraindication with in-laws irritates her. Dislikes company and consolation <ed. She is indecisive. Fear of darkness. Weeps while detailing her complaint. Forgetfulness, forgets to switch off the gas while cooking at right time. She attained her menarche at the age of .13. Her periods were regular once in 28-30 days with 4 to 5 days flow. Greasy face and thick hair growth on upper lip. 8. MIND - CONSOLATION - agg. - Sympathy agg.